It's easy to blame “Brussels bureaucrats” but national governments are often the biggest corporate lobbyists of all, a new report exposes today. 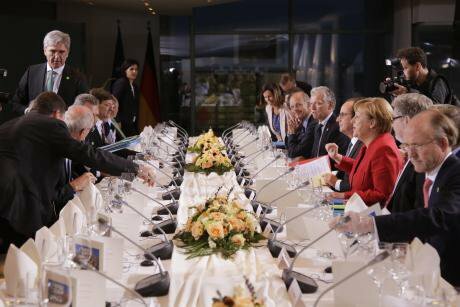 Image: German Chancellor Angela Merkel and then-French President Francois Hollande in a rare photo of the European Round Table of Industrialists, 2016. Credit: Markus Shreiber/DPA/PA Images, all rights reserved. It’s easy to blame those infamous-yet-anonymous Brussels bureaucrats for the decisions which come out of the EU, but in fact all member state governments - including our government’s ministers and officials, at least until Brexit kicks in - are around the table when EU rules and regulations are discussed and agreed. And – as a new report reveals today – too many governments take conscious and proactive decisions to support corporate interests over the wider public interest. In fact member states are the missing part of the jigsaw - alongside the European Commission, elements within the European Parliament, and the EU treaties - which explain the pro-corporate bias of too many EU laws and policies. But the secrecy around how member states act at the EU level, as well as around which corporate lobbies they are talking to, contribute to creating myths and misunderstandings. Remember how, in the UK Brexit referendum of 2016, TTIP, the proposed EU-US trade deal, was often cited as a reason to leave the EU, capitalising on very legitimate public concern that TTIP would lead to the further privatisation of the NHS? But what was lost in that debate was the way in which the UK Government had been proactively pushing for TTIP in Brussels, including supporting the inclusion of health services in the scope of the deal. And of course now the UK Government is touting for a post-Brexit trade deal with the US which would rival TTIP, and which would be negotiated without democratic scrutiny! The new report from Corporate Observatory Europe exposes for first time how member states – the UK, Germany, Spain, Netherlands, Poland and others - act as middlemen for corporate interests in EU decision-making. For starters, elite corporate lobbies have access to EU leaders that NGOs and trade unions simply cannot match. Take for example the regular meetings of the European Round Table of Industrialists, which brings together 50 bosses of major European multinational companies such as Telefónica, Siemens, Total, and BMW, with the leaders of France and Germany. Or the cosy cocktails between member states’ trade officials and the European Services forum which represents Vodafone, HSBC, and Deutsche Telekom. Combine this kind of privileged access with the lobby firepower of the corporate sector which massively outspends that of civil society, and it is not surprising that the progress or outcomes of a wide-range of dossiers, from ePrivacy to the Financial Transactions Tax, from climate change to chemicals regulation, suit corporate interests at the expense of the public interest. Beyond specific dossiers, member states have collectively absorbed some corporate agendas and adopted them as part of the EU-wide agenda, such as on economic governance (strict fiscal rules and austerity), the so-called ‘innovation principle’ (undermining precautionary approaches to regulation), and investors’ protection in trade treaties (allowing corporations to sue states for billions in compensation when governments act to protect their people and the planet). At its most extreme, some member states and national corporate lobbies have developed a symbiotic relationship whereby the national corporate interest has, wholly wrongly, become synonymous with the national public interest as presented by the relevant government at the EU level. This is often greased by revolving door exchanges of staff, political donations, and close personal relationships between key players. The Dieselgate scandal showed how the influence of the car industry on German politics led to weaker EU vehicle emissions’ regulations; the state-owned coal industry led the Polish Government to threaten to use its veto on climate targets; while the City of London, can consistently count on the UK Government to back its demands for the lowest possible financial regulation. This corporate influence has been apparent for decades, especially since the inauguration of the EU’s single market in the 1980s, but as successive treaties have made the EU responsible for more and more issues and cemented the role and power of key member states institutions such as the European Council and Council of the EU, governments are increasingly acting as a channel for corporate interests. The result is an accountability and democratic deficit. But it doesn’t have to be this way. Some parliaments like those in Denmark, Sweden, Finland, Austria, and Germany have powers to review planned government negotiating positions on EU matters in advance; in Sweden the government can even check-in with Parliament “by email, text message or phone calls” on last minute additions to the Council’s agenda or in cases where the Swedish position needs to be adapted. Meanwhile the regional Walloon Parliament in Belgium held dozens of hearings on the EU’s trade deal with Canada, CETA, which ultimately led to the active involvement of the Walloon Government in the CETA ratification debate. Across the EU, 2000 TTIP and CETA ‘free zones’ have been declared by regional and municipal authorities concerned about the impacts of these treaties on their local communities, and determined to stand up against corporate-influenced EU agendas. The UK government has a strong voice to be able to articulate the public interest at the EU level. But the UK has rarely chosen to do that. And with Brexit looming, it seems too late to revisit how the UK feeds into EU decision-making. But elsewhere in the bloc, 2019 will be a really significant year with European Parliamentary elections due in May and a new European Commission to be appointed in the autumn. As a result pan-European debates on the role of the EU will only intensify and the role that governments play in the bloc must be part of the discussion. Vicky Cann works for Corporate Europe Observatory, who expose and challenge the privileged access and influence enjoyed by corporations and their lobby groups in EU policy-making. She is co-author of “Captured states: when EU governments are a channel for corporate interests”.